After learning about the operant conditioning process, students complete this worksheet in a Psychology/AP Psychology class to practice application of the learning process. There are twenty-five problems in total, and they are all unique real-world examples of how operant conditioning works. 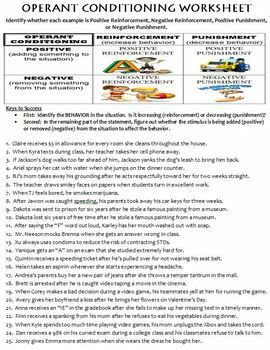 Directions are also included for how students should tackle operant conditioning problems along with a chart that helps explain the differences between positive reinforcement, negative reinforcement, positive punishment, and negative punishment. Answer key is attached. 1. Claire receives $5 in allowance for every room she cleans throughout the house. 2. When Kyra texts during class, her teacher takes her cell phone away. 3. If Jackson's dog walks too far ahead of him, Jackson yanks the dog's leash to bring him back. 4. Ariel sprays her cat with water when she jumps on the dinner counter. 5. BJ's mom takes away his grounding after he acts respectfully toward her for two weeks straight. An accompanying PowerPoint used to teach operant conditioning can be found here, if you are interested.